The CTRL49 is a full-featured USB/MIDI keyboard, complete with VIP integration and Mackie/HUI support for instant integration with most DAWs. 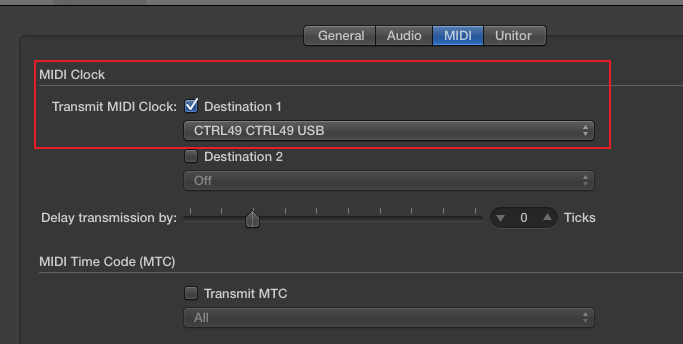 This articles provides a complete walkthrough for CTRL49 and VIP setup and mapping in Logic Pro X.
Connect the CTRL49 to your computer using a USB cable. Press the SETUP button > Logic Pro X. Press down on the Data Dial to select. Use the navigation arrows to navigate to Transport Format and use the scroll knob in the center to make sure this is set to "DAW Fader"
Press the Page Right button twice and use the navigation arrows and data dial to change the Clock Source to External. To save the global settings for next time, press the Page Right button again and select Save Global Settings. The lights will flash to confirm the save. Open Logic Pro X and create a new session. In the Synchronization window, select the MIDI tab. Within the MIDI Clock section, check the Destination 1 box and, in the drop down menu below, select Port A for your CTRL49 USB controller. The M-Audio CTRL49 comes complete with Mackie/HUI functionality for quick and seamless integration with virtually every popular DAW, including Logic Pro X. This makes setting up the CTRL49 transport and fader section incredibly simple. 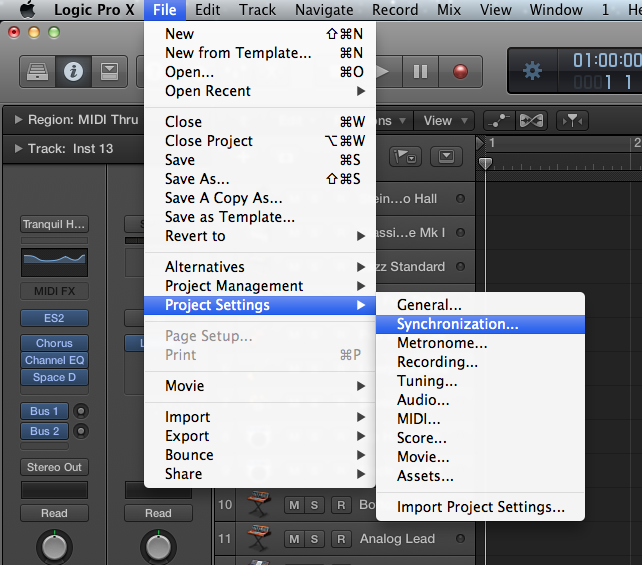 Select Logic Pro X from the top bar. Choose Control Surfaces > Setup... from the menu. 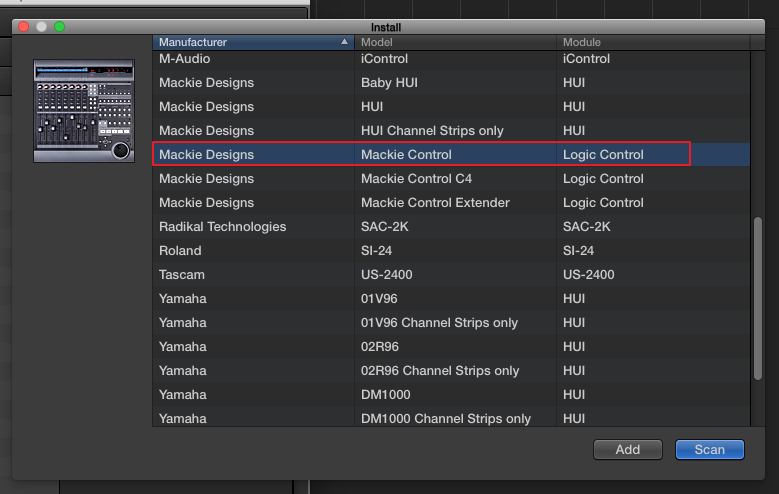 Click on New > Install... in the control surface setup and and choose Mackie Control from the list. Click Add to add the device and then close the window. In the top left, find Output From and Input From and choose CTRL49 Mackie/HUI as the port for both. After setting this, the screen should look like this. Your CTRL keyboard is now setup to have fader control, transport control, and knob control. Please Note: If the wrong port is selected as the input/output port for the Mackie Control Surface, or the control surface is not in use at all, you may experience unresponsive keys, keys opening and closing windows, and/or faders affecting the pitch of your virtual instrument. Simply double-check and re-assign the Mackie Control Surface ports to CTRL49 Mackie/HUI. For more information about the different controller assignments and options, please see the Controller Assignements section of this guide. 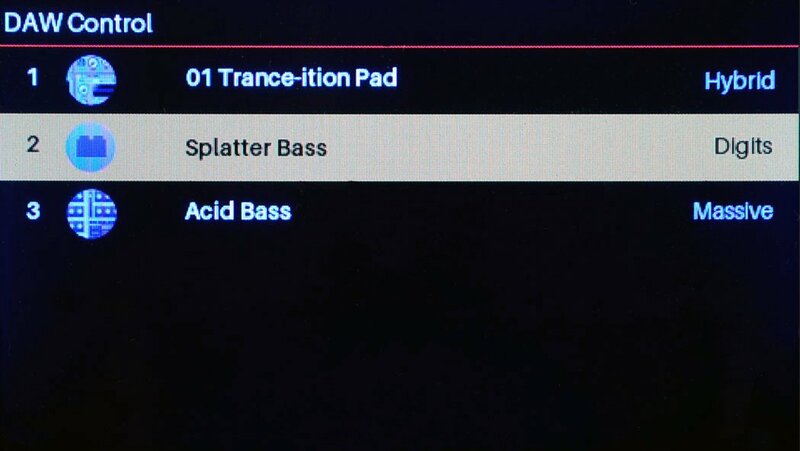 Locate the Track Column on left for the new instrument track you just created. Scroll your mouse over the Track Insert button (highlighted below) and it will change from the name of the instrument to showing various insert controls. The VIP interface will now open on your track. You can open as many instances of VIP within Logic Pro X that your computer processor can handle. 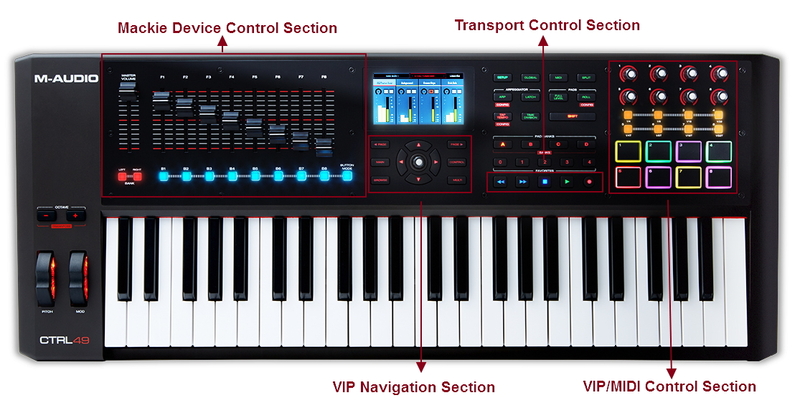 The CTRL49 will control one VIP instance at a time, and you can then quickly change which VIP instance the CTRL49 is controlling using the DAW Control mode. Please note: DAW Control mode will change which VIP instance the CTRL49 is focused on for preset browsing/organization, and controlling plugin parameters via the 8 rotary knobs and buttons. However, MIDI note messages from the keyboard and pads are still routed by Logic Pro X, so you'll still need to select which VIP instance you'd like to perform on by highlighting or arming the track in Logic. See the Controller Assignments section for how to easily use the Mackie/HUI switches to select your tracks from the CTRL49. Use the Data Dial on the CTRL49 to scroll through the available VIP Instances, and push in the Data Dial to select it. This icon will flash to indicate the currently selected instance of VIP. 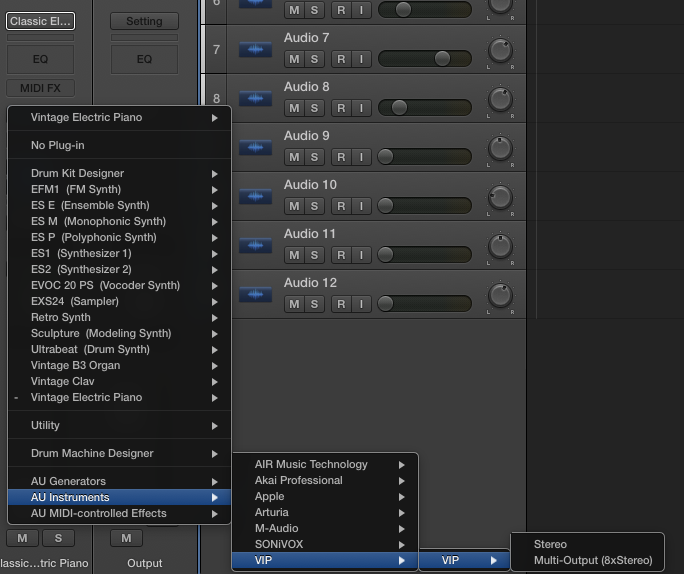 Many VST instruments can send multiple separate channels of audio to a DAW like Logic Pro X, including VIP. Consult your VST instrument's user guide for more information. VIP will recognize and open these multi-out plugin versions. Here are the steps to route these separate audio tracks with Logic Pro X. 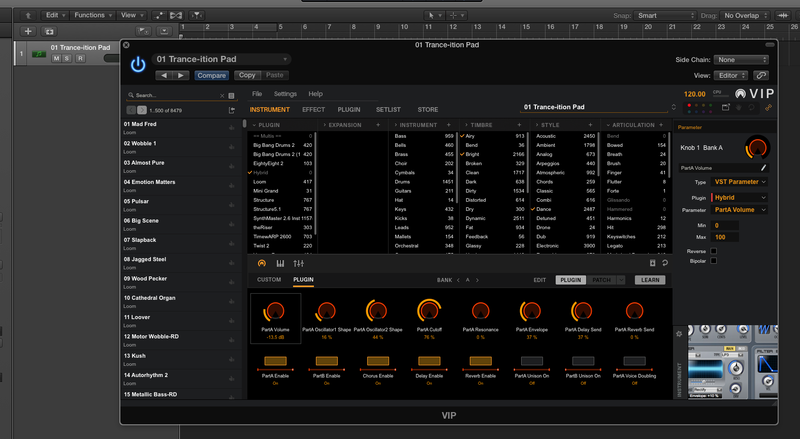 Add a software instrument track and add the VIP > Multi Output (8xStereo) plugin. 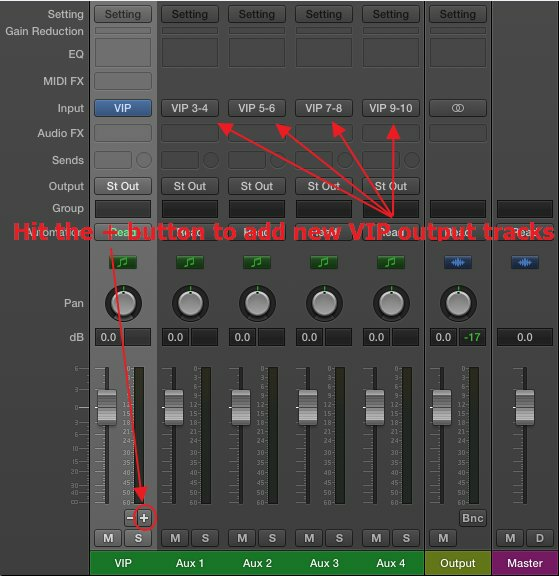 From Logic's mixer view, you'll notice this VIP Multi Output track will have a plus and minus sign just above the Mute/Solo buttons. Press the plus button to add new outputs from VIP. 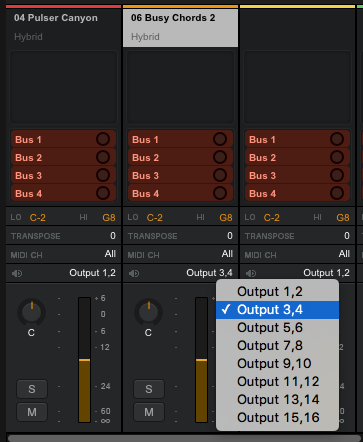 In VIP, any scanned VST Instruments that has multi-out versions will be listed separately. Load one of the multi-out versions. Route the audio outputs within your VST Instrument as instructed in the program's user guide. The individual audio tracks in Logic will receive this separated audio channels. That's it! This section will automatically sync with VIP when VIP is opened. The encoders, switches and pads will automatically map to the assignable encoders, switches and pads in the control panel view in VIP. Their assignments will depend on the currently chosen plugin inside of VIP. Their assignments can be changed from the VIP interface or from the CTRL49 by pressing the CONTROL button to access the control view. If you'd like to map the knobs, switches and pads to functions in Logic Pro X, simply press the MIDI button at the top of the CTRL49. The section will disconnect from VIP and switch over to MIDI control mode where the parameters will take on assignable CC and MIDI note functions that can be mapped manually inside of Logic Pro X or any other DAW software. This section is used strictly for navigating inside of VIP and the CTRL49 display. This section cannot be mapped to any outside parameters. When in MIDI Control mode, press any button in this section to return to VIP control mode.